Nothing like winter sailing on the bay! My life has been creeping up into the realm of exorbitantly busy of the last few months. I went from working 2-3 days a week to full-time – 5 days a week – for the first time in my life! I know, I know, I’m a wimp. 5 – 5:30 am – wake up, bike to the gym for either swim practice or weights with my husband. I’ve left the house for good at this point. 7:30 – bike from the gym to the BART station and take the train to work. 8:15-8:30 – stop at a cafe by the museum for coffee before heading to my desk. This is when I eat breakfast: at my desk once I get to work. I get there a tad early so I can relax for a few minutes with my coffee and overnight oats. 8:30 am – 5 pm: work! I always go outside for lunch, which I pack every day. …till 9:30 or 10 pm – make and eat dinner; make my lunch and Lee’s lunch for the next day (usually interspersed with making dinner); gather my gym gear and work clothes for the next day; sit down on the couch for 5 seconds while I eat dessert; go to bed. That’s my action-packed day (hah!). As you can see, 2 out of 3 meals and many snacks are eaten on the go. That means I’m really packing breakfast, lunch, and snacks every evening. I’ve become pretty efficient at this but there is always room for improvement. My breakfast, for example, is almost always overnight oats (made with greek yogurt and chia seeds + pumpkin this time of year and eaten with a banana). I get my leisurely bowls of hot oatmeal on the weekends. When pressed for time, however, it’s really nice to have a grab-and-go alternative for breakfast. That’s where CORE Foods comes in! I met CORE at the DailyBuzz Food blogger fest in the fall. Their tiny little samples of wonderfully simple meal bars won me over right away. According to the CORE website, Each pack is one full bowl of raw oatmeal-to go. Oatmeal I don’t have to assemble or cook?! Sign me up! These aren’t you’re average sugar laden granola bars or protein bars packed with artificial ingredients either. 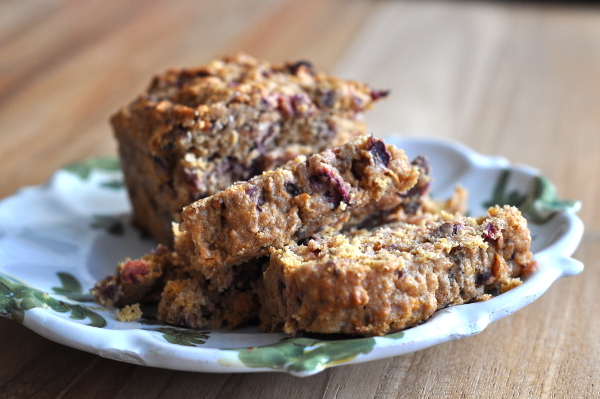 CORE bars are made of what I’d actually put in my bowl every morning: oats, nuts, fruit…5-7 locally grown ingredients. The company, which is a nonprofit, recommends drinking two glasses of water along with your CORE meal. That makes for a fully-fueled, satisfied belly for a good long while. 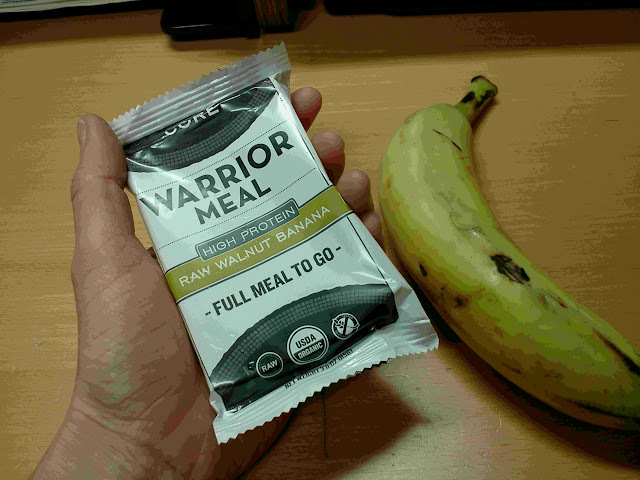 I sat down to my desk with my Warrior Meal, a banana, coffee, and water. 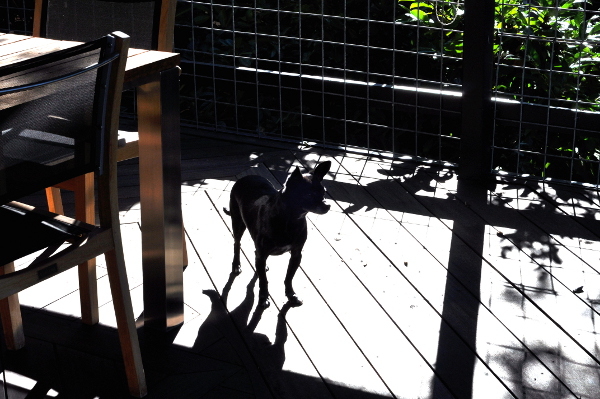 I tried to eat the bar slowly and mindfully, as I tend to wolf-down things like this. The bar was good! I loved the chewy consistency and natural level of sweetness. I had a fantastic breakfast without the preparation and bulky container to transport. All three flavors were great and contained just the right amount of breakfast calories for me when paired with some fruit. They bars also held up well in my bag: no squished, melted stuff here. An even better use for a Warrior Meal: breakfast on the ski bus on the way to Tahoe last weekend! I woke up starving after sleeping for the first half of the drive (4:30-6:30 am) and was so, so glad I’d brought my own, real-food breakfast. The Warrior Meal gave me much better lasting energy for snowboarding that the crappy bus-provided breakfast would have. Since CORE bars aren’t loaded with preservatives, they store best at cold temperatures – at least in the fridge but the freezer is best. I’d like to add a box of these bars to my freezer for easy meals but I might have to get a bigger freezer first (mine is painfully tiny)! I wrote this last week before leaving on a limited-internet-access vacation. By the time this post is published, our trip will be almost over and we might be cursing the snow but I bet we’ll be fantasizing about moving back to the mountains. Tomorrow Lee and I are boarding a plane for Denver, the city where we met. I anticipate heavy sentimentality saturating this vacation. We’ll be spending time in the mountains where so many of our early dates (and by dates I mean expeditions) took place. Maybe we’ll drive past places we used to live, restaurants where we ate together, sights we knew. Unfortunately, this kind of thing makes me very sad. I inherited this morose nostalgia from my father. Even looking back to see happy memories makes me sad that those experiences are over. I suppose this has something to do with my inability to live in and enjoy the present…gonna have to work on that. In an effort to rescue myself and this vacation from despondency, I thought I’d share a little bit of my happy memories from the Colorado era of my life. I moved to Denver for graduate school in 2007, landed a career-changing internship with the National Park Service in the summer of 2008, and met my future husband in the same month. I look back on that time as the happiest of my life. Lee and I went on adventures in the mountains together. We had season ski passes and spent almost every weekend doing something active outdoors. We spent time at my family’s cabin and dragged my dog up a few 14ers. 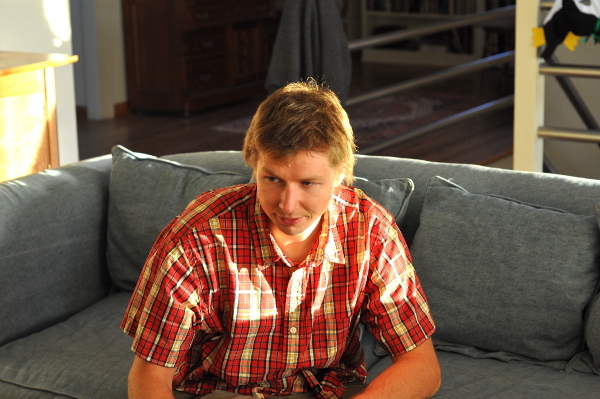 I had good friends in my graduate program and landed a series of jobs in my field. I wouldn’t say that I’ve been unhappy since I left Colorado, life has just been more complicated. I left the hardest part of graduate school (writing my thesis) for after we moved back east. Once that was behind me, the years Lee and I spent travelling on our boat were simultaneously wonderful and excruciatingly difficult. We got married (yay!) but we also put our relationship and our individual strengths to the test. 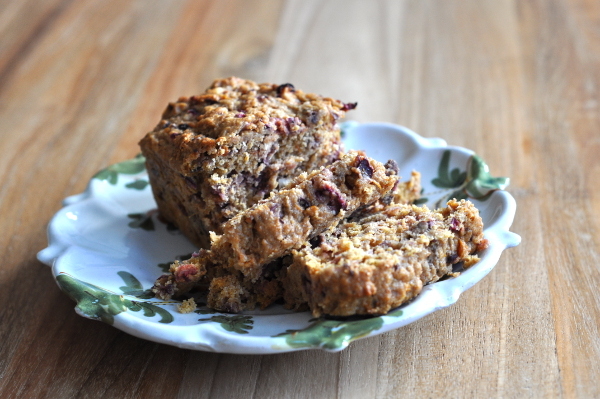 Fruit cake, this month’s recipe swap dish, is sticky sentimentality manifested in food. I think of it as being saturated with buttery, sweet, dense, richness – everything that a holiday treat should be. 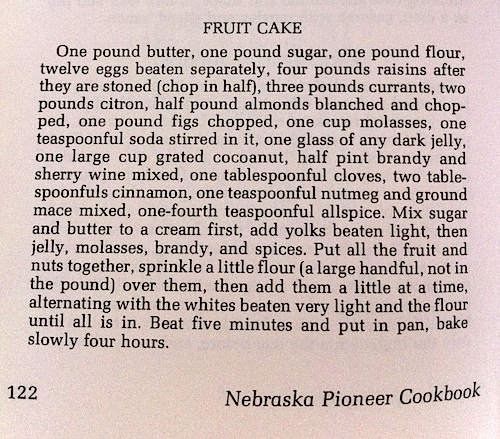 I also associate fruit cake with vintage cookbooks, something I’ve been up to my ears in lately. We found two more boxes of my grandmother’s cookbooks and I’ve been drooling over the little time capsules of culinary history. 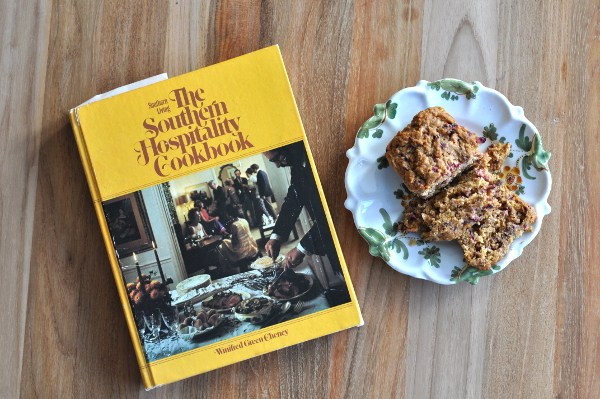 A James Beard cookbook that my great aunt gave my grandmother on her 39th birthday caught my eye first but it was The Southern Hospitality Cookbook that ended up on my lap one evening. I paged through recipes for Southern classics and wondered which of them Helen had made. 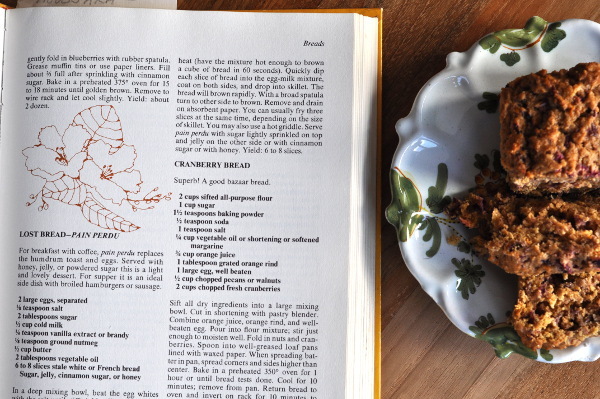 Moussaka, of all things, was bookmarked but I found my way to a simple recipe for cranberry bread. I had fresh cranberries (from the CSA, of course) in my fridge. I had almost all the ingredients. As Lee would say, done and done. This is not a fruit cake. It bears no resemblance to the classic fruit cake recipe Christianna sent us for this month’s recipe swap. True, it is festive, but it lacks the sticky-sweet sentimentality of fruit cake. Maybe that’s for the best. Clearly I don’t need any more nostalgia in my life. I know my fellow recipe swappers will give you a dose of the traditional and untraditional fruit cake you crave! Seeds scraped from one vanilla bean or 1 tablespoon grated orange rind are nice additions. If melting coconut oil, place in oven in an oven safe dish. Oil one 9X5 loaf pan or several smaller pans. In a large bowl, stir dry ingredients (first 6) together with a whisk or fork. Cut in coconut oil or butter with a whisk, two knives, or a pastry blender. Beat egg, juice, and vanilla bean, if using, together in a separate bowl. Add liquid ingredients to dry, stirring until just moistened. Pour mixture into prepared loaf pan(s). The batter is rather thick so you might need to spread it around a little bit. Bake for 30-35 minutes for mini loaves and 45 minutes to 1 hour for a large loaf, or until a toothpick inserted in the center of the bread comes out clean and the top is slightly brown. Cool on a rack before slicing. Thanksgiving was…more than week ago. It actually seems much farther in the past now. I want to write something about our gathering and meal before I forget! Lee, a friend, and I went to my dad and his wife’s (it seems strange to call her my stepmother) house in Napa on Thursday morning. I had baked my dessert contribution (this Chestnut Pound Cake) the night before. Smelling the cake in the oven really got me in the mood for the holidays! I also brought a giant cooler full of food. There was a huge head of cauliflower I planned to roast for dinner, ingredients for Beet-Ginger Chutney, and some other random goodies like a pomegranate and several persimmons in case we needed another salad. Oh, and there was an emergency container of Trader Joe’s shelf-stable whipping cream just in case! 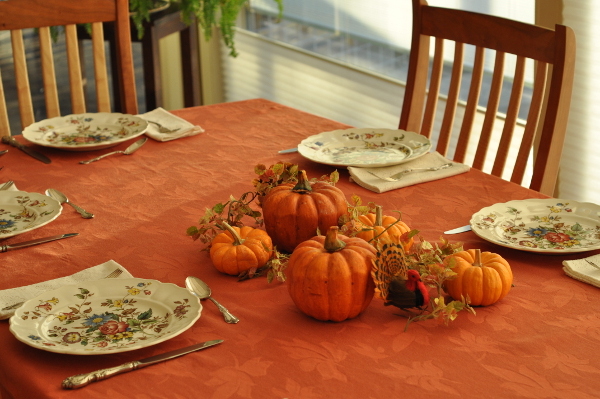 Napa is beautiful in the fall and it’s the perfect place for a Thanksgiving gathering. We hung out at the house, snacking and cooking. Snitching crumbs of dried out cornbread and biscuits meant for the dressing was the best part. It felt like such a luxury to be able to lounge around all day, not to mention spend the entire day with my husband and family. Doc liked it too. Eventually, people started to dribble in. There weren’t really that many of us there for dinner – eight I think. We took went for a lovely little walk before the final push in the kitchen. Someone set the table as the sun was sinking to window level. There was slight panic when we realized we needed a second oven, followed by relief when we discovered that the microwave doubled as a convection oven. I think that was it…The cornbread dressing, beloved timeless classic that it is, was the star of the meal. There was enough for days of the best leftovers ever! I will have to find out what brand the ravioli was. I think it came from Whole Foods. It was absolutely delicious with a slight almond flavor. Dessert was bountiful. We had homemade pumpkin pie, homemade pecan pie, and my Chestnut Pound Cake, all topped with whipped cream. After dinner entertainment was lots of fun. We got everyone to play Cranium, making the homey-family gathering complete. After that everything is a fuzzy food-coma memory. The rest of the long weekend was equally great. No Black Friday shopping for us. Lee was sick, unfortunately, so I did a good bit of running on my own. I even went to a Body Pump class on Saturday morning, something I haven’t done for a long time. We visited my dad’s cousins a my second cousins on Saturday (wow, there’s a lot of ’em) and went to see Skyfall (loved it!). Lee and I spent the night at the boat on Saturday and went sailing with my dad, his wife, and a friend of mine from work on Sunday. So yeah, it was a pretty idyllic weekend. I’m hoping that becomes the new norm! This weekend looks like it’s going to be pretty great too (It’s raining in SF and I love the rain!). I don’t know what feels better: eating homemade cookies myself or baking cookies and giving them away. I need to do both more often. I made these a couple of weeks ago, maybe more. It was one of my first weekdays off from work after a brief full time stint. Observation from that experiment: when I’m at work, all I want to to do is go home and bake. 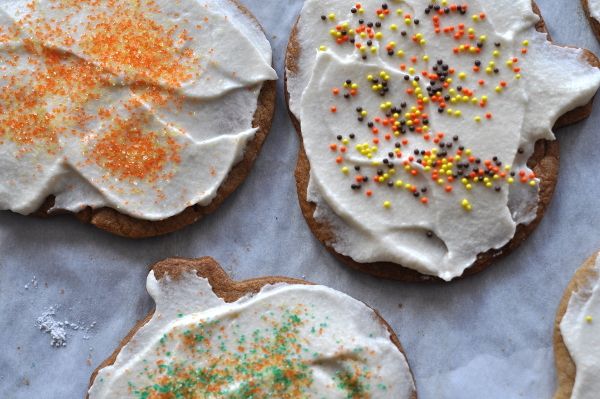 When I’m home, I don’t often pause my day to do something fun or relaxing, like bake and eat cookies. These cookies, rather large pumpkin cut-outs if you can’t tell that from the picture, went to Lee’s work. Doc and I walked them down there ourselves. It’s kind of an unpleasant walk down a very busy street. The sidewalk is usually studded with trash and homeless encampments. I take a different, prettier route on the way back and I suppose I could take it both ways. There was already a lot of food laying around the office when I got there. That made me sad, of course. My poor cookies would be lost in the jumble of pan dulce and pizza, unappreciated. Oh well. It’s funny, I like bringing food to people but I don’t actually like being thanked for it. It embarrasses me to hang around while people sample my baked goods. I mistrust their praises and think they must be choking down bites of cookie just because I’m there, so I leave. I drop my cookies and run. I don’t normally ice cookies unless they’re Christmas cut-out cookies. 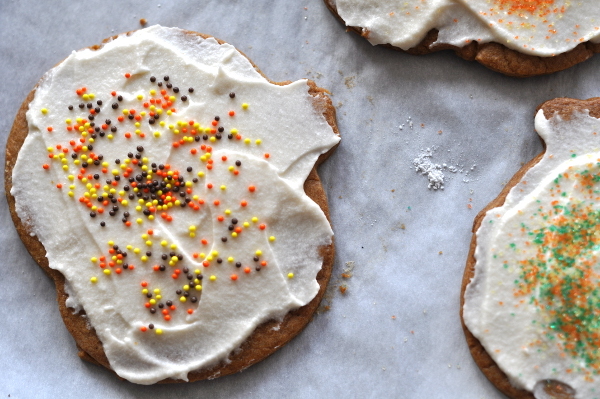 These soft, lightly spiced, Swedish ginger cookies would be perfectly fine without icing. I mostly slathered it on there because I was worried about what other people would think of unfrosted cookies. I don’t want to be known as that crazy woman who only makes healthy food so I got out the powdered sugar and butter and made a frosting/icing of sorts. It turned out remarkably well considering I didn’t follow a recipe and just blindly added powdered sugar to butter, a splash of milk and a little vanilla extract in my food processor. At first it was lumpy but a little more sugar did the trick. I wish I had written down the ratio of ingredients I ended up with. Oh well. Next time. As for the cookies, I followed this recipe almost exactly. 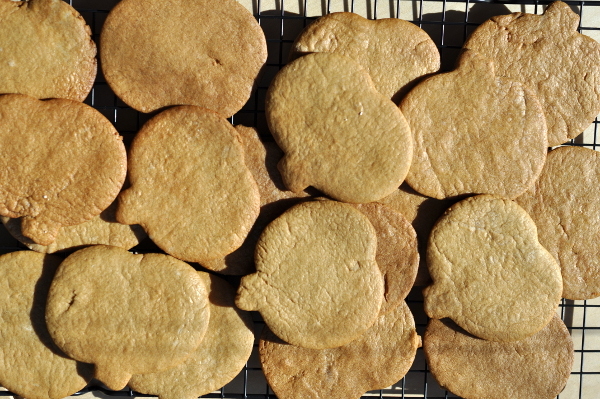 I did use all brown sugar, no white, and half whole wheat flour. I also used Earth Balance instead of butter, making my cookies vegan. 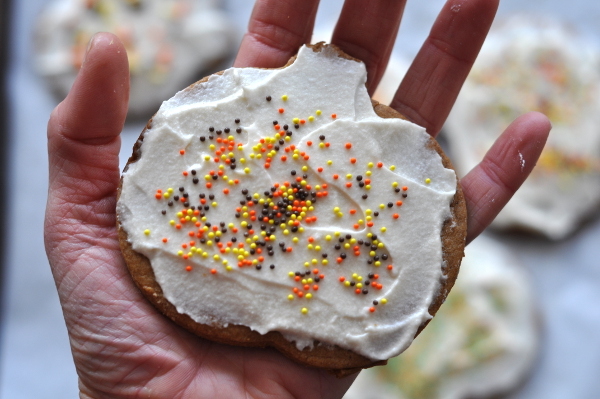 This recipe is very similar to my grandmother’s Ginger Cookies but I think I prefer the old family recipe. I’ve never tried to roll out that dough, however, and this dough was pretty easy to roll out and cut. Before I forget again, the winner of the Nature Box giveaway is Christina! A box full of healthy snacks is on it’s way to her as we speak! Thank you to everyone who entered. I hope to host some more delicious giveaways soon.